Dubspot is proud to partner up with Paxahau, Detroit’s premier promotions group for the electronic music to once again celebrate the city’s legendary Movement Electronic Music Festival. Join us during the three-day festival in the all-new Technology-Area for educational demonstrations, learn about our courses, and hang with some of the crew. 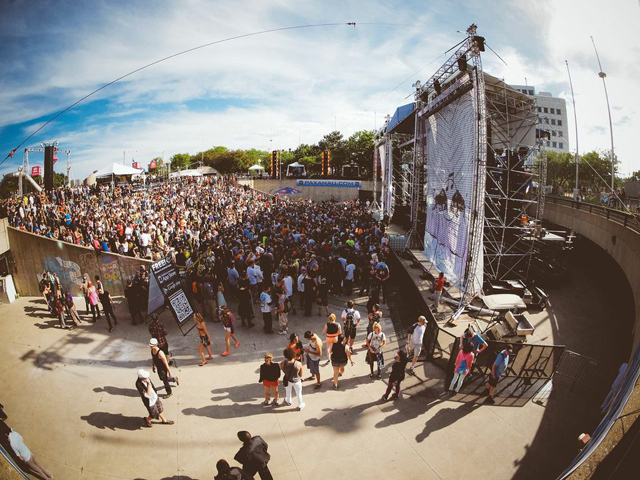 This Memorial Weekend, Detroit will transform into the Mecca of Techno and House music as over 100,000 anxious dance music fans descend upon Hart Plaza, the cities legendary riverfront destination for the Movement Electronic Music Festival. For over a decade, Movement has celebrated Techno, House, Hip-Hop, and Detroit’s extensive legacy of musical roots and creative power. The festival is globally recognized for its unique talent curation and programming, showcasing artists from a wide spectrum of pioneers, up-and-comers, local luminaries, and industry innovators. The festival takes place May 23-25 and features six technologically-rich outdoor stages bringing in more than 140 artists ranging from veterans such as Richie Hawtin and Kevin Saunderson to festival newcomers Disclosure and Snoop Dogg. Enjoy an extensive amount of amenities available to all attendees including the all-new interactive Technology Area featuring the hottest gear in the industry, art displays to stimulate the senses, lockers, free bike valet, expanded food options, and the enhanced Riverfront Biergarten. Also, you can customize your experience with the all-new Movement app and charging stations. Step up your experience and enjoy the posh VIP setting located behind the main stage and let the party continue from dozens of official afterparties. 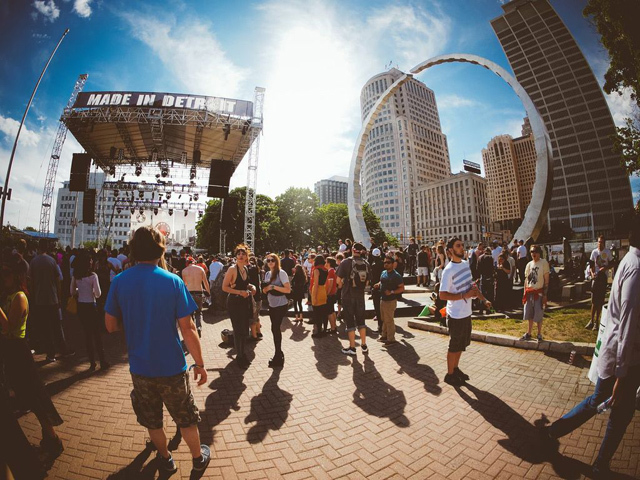 In celebration of the city’s events and festivities taking place during Movement weekend, Detroit Mayor Mike Duggan declares May 23-25 as Detroit Techno Week in the city’s annual Letter of Recognition for the event. Richie Hawtin, DJ Snoopadelic, Dog Blood, GRiZ, Art Department, Loco Dice, Dixon, Luciano, Recondite – live, Art Department, Bob Moses – live, Maceo Plex, Ten Walls – live, Snoop Dogg as DJ Snoopadelic, Boys Noize, Skrillex, Patrick Topping, and many more. Disclosure, 30th Anniversary of Metroplex Records with Juan Atkins’ Model 500 and Eddie Fowlkes, Squarepusher – live, Kenny Larkin – live, Octave One – live, Kerri Chandler, Eats Everything, Method Man, Hudson Mohawke, Danny Brown, JETS (Jimmy Edgar + Machinedrum), Joy Orbison, Ben UFO, and many more. Tuskegee (Seth Troxler b2b The Martinez Brothers), Joseph Capriati, Joris Voorn, Henrik Schwarz – live, Soul Clap, Maya Jane Coles, Hot Since 82, Dubfire, Nicole Moudaber, Joris Voorn, Paco Osuna, and many more. Carl Craig feat. Mike Banks, Stacey Pullen, Matthew Dear, Ryan Elliott, Kevin Saunderson & Derrick May present “Hi-Tech Soul,” MK (Marc Kinchen), Lee Foss, Floorplan, PHUTURE – live, Shigeto – live, Paul Woolford, Dink & TK, and many more. Regis, Ben Klock, Ben Sims, Paula Temple, Marcel Dettmann, Nina Kraviz, Sterac aka Steve Rachmad, Matador – live, and many more. Sinistarr, Mark 9EN Moss, Earl “Mixxin” McKinney, Bruce Bailey, 313 The Hard Way (DJ Seoul b2b DJ Psycho b2b T.Linder), Shawn Rudiman, Dilemma, Calico, Andy Garcia, ADMN, and many more. 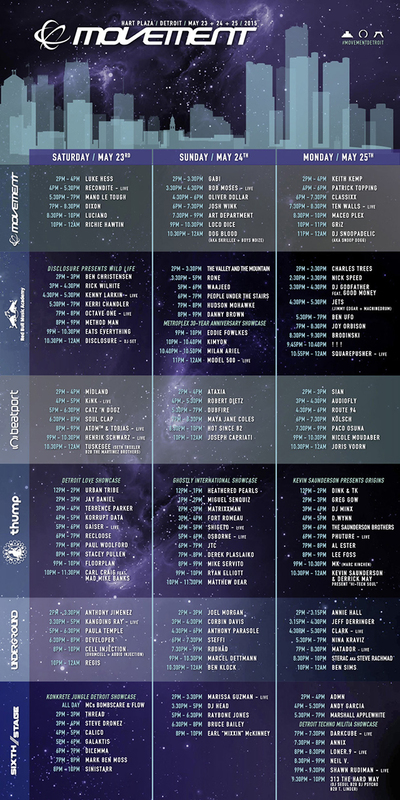 Official Movement Afterparties Schedule here.